Lola Lemire Tostevin was born into a French-speaking family in Timmins, Ontario although she writes mainly in English, and wonderfully so. That being the case, her poetry, novels, and essays communicate her interest in “contamination” (over ideologue-ish notions of purity or concepts that limit expressions of the individual), promulgating creative work that combines aspects of one language or culture with another, or for that matter, one genre with another. Lest this be misinterpreted as your typical dualistic-dialectical-pseudolinguistic honeytrap, it is relevant to add that Tostevin’s work, including her most recent book of poetry Singed Wings about remarkable female artists, including Camille Claudel, Louise Bourgeois, and Frida Kahlo, opens up and offers to the reader a multiplicity of selves, all of them adept at making use of the tools they hold out to you. 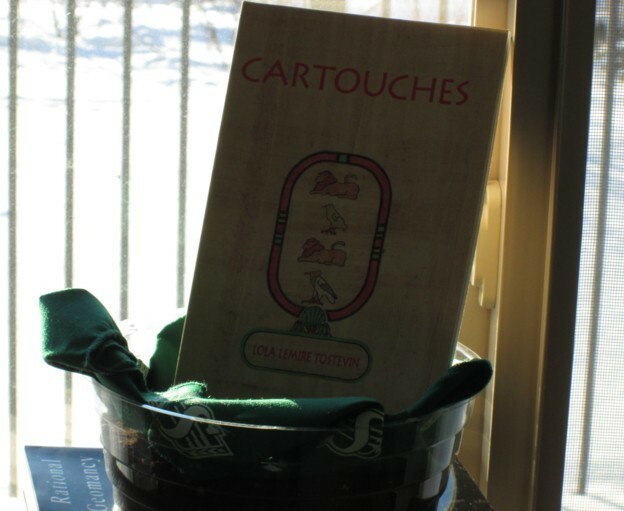 Tostevin’s Cartouches includes poems and journal entries, and the book traces the poet’s pilgrimage to Egypt, where she reflects on the sacred Egyptian traditions concerning death, a journey that happens to coincide with her father’s long illness, and ultimately, his passing away. The book consists of poems with austere solemnity and yet also those with sincere intimacy where the stateliness of a public event is transformed into personal experience. In the section “Small Amulets” Tostevin allows room to mourn for her dear departed friend bpNichol, the brilliant poet who was taken from Canada and the world ‘before his time’, although with his characteristic good humour, Nichol would perhaps be the first to interrogate such a questionable phrasal construction, breaking it down into ... say, a laughing slinky of letters.